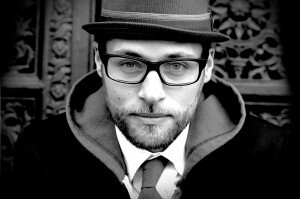 MC YOGI (aka Nicholas Giacomini) grew up in Northern California, painting graffiti & listening to hip hop music. He spent most of his high school years at a group home for at-risk boys where, inspired by artists like the Beastie Boys & Run DMC, he began writing and performing his own raps for friends at house parties. Hip hop culture provided both a soundtrack and a creative outlet during MC YOGI’s turbulent teenage years. At age 18, on a whim, he joined his father for a yoga and meditation intensive with a famous spiritual teacher from India. Deeply moved by this unexpectedly powerful experience, MC YOGI devoted most of his free time to learning everything he could about the ancient discipline. He spent the next two years studying the physical forms of yoga as well as meditation, philosophy, and devotional chanting. It was at a yoga teacher training program in San Francisco that he met and fell in love with his wife, Amanda. Together they traveled to India and, upon their return, opened Yoga Toes studio in Point Reyes, California. MC Yogi’s dedication to yoga did not diminish his lifelong love of hip hop. Now, by combining Indian music and mythology with infectious hip hop beats, MC Yogi creates an exciting new sound for a new generation of modern mystics, urban yogis, and conscious hip hoppers. MC Yogi himself is a spiritual practicioner and truth-seeker. He reads the Bhagavad Gita every day, follows Gandhi’s humble practice of not speaking a word on Mondays. The rest of the time is split between creating art, running the yoga studio he owns with his wife, and of course, music. MC Yogi’s album, Elephant Power is the perfect fusion of east and west. He includes positive rap based on Indian deities, mantras, and combines Indian instruments like sitar and tambura with hip-hop rhythms.